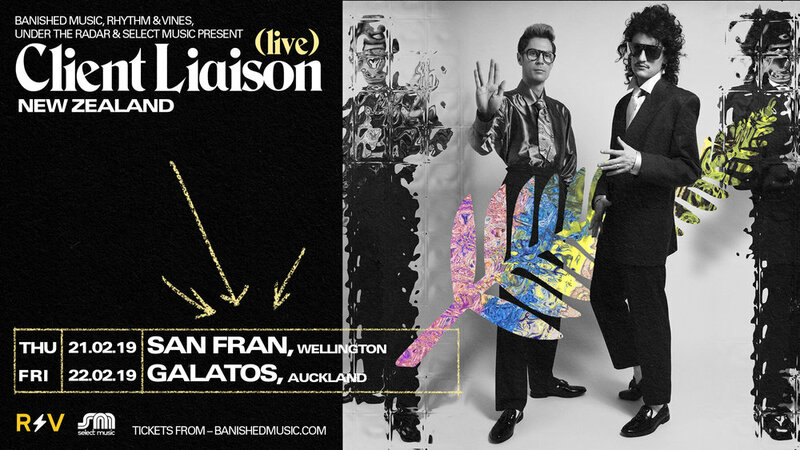 Rhythm & Vines, Banished Music, Under The Radar & Select Music presents the Client Liaison New Zealand Tour, February 2019. Given their shared appreciation for story telling and dignified belief in the Australian identity, Harvey Miller and Monte Morgan naturally found themselves writing music together. From the studio to the top end of town, Client Liaison’s sound plays out like a long lunch followed by a round of cocktails. Describing their sonic palate as ‘dance electric’, ‘new jack swing’ and ‘pop ballad’, this multi-sensory experience will feed any listeners’ appetite. International in flavour, cosmopolitan in style – this is Client Liaison. After a colossal 2018 which saw the band launch Expo Liaison, Client Liaison's curated festival (featuring John Farnham); release their first fashion line; and confirm the 2019 Kylie Minogue Australian tour support slot; they return to New Zealand in 2019 for two headline shows.